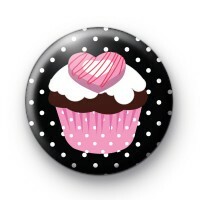 Pink and Black Cupcakes badges with a black background and pink polka dots. This cupcake badge features a huge brown cupcake with white icing and a pink love heart sweet on the top all in a lovely pink cupcake case. We have a range of cupcake badges available and baking badges, so be sure to take a look around the website. Perfect for cake making classes and baking classes. 25mm button badge made in the UK.